Tail Section – Note: no plate cooling holes. The Monitor Grand measures approx. 6’8″ in length and 4’7″ in width. The piano features a sectional case with a square rear corner in the tail. The cabinet features curved arms with carved details and a double molding around the case. The legs are carved Monitor legs with hidden casters – a specific style reserved for this scale design. The music desk is of the period carved lattice style. The case is in a rich cut of Brazilian Rosewood which was standard during this period. The Monitor was the first Steinway grand with a 20-note bass section, a full cupola cast iron plate, and a continuous soundboard bridge. The Monitor gets its name due to it claiming the place as the first Steinway grand with a full cupola plate. This use of additional cast iron resulted in the nickname “Monitor” a reference to ironclad warships utilized by the Union in brown and shallow blue water naval combat during and after the U.S. Civil War. 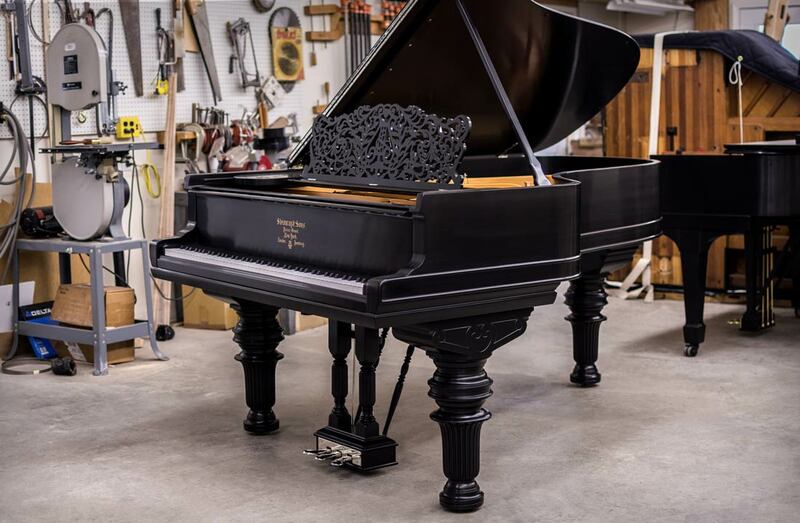 Built in 1872, Steinway & Sons Monitor (Style 1) Grand Piano #26797 has undergone an extensive rebuilding process. According to Steinway Factory records, this piano was shipped to Lawrance, Kansas on May 2nd, 1873. Dennis Chupp actually inspected and evaluated this piano early in his career almost forty years ago. Many years later, the family got in contact with us again requesting a full restoration of their family piano. A new solid spruce soundboard was installed along with a custom-fitted hard maple pinblock. The soundboard’s rib positions were optimized for the best possible tone. The historic cast iron plate was re-bronzed and the raised lettering was detailed by hand. New highest quality music wire and soft copper wound bass strings were coiled to period-appropriate blued tuning pins. The original damper back action was restored and retained. The piano’s figured Brazilian Rosewood cabinet was refinished in a closed pore, hand rubbed lacquer. The original nickel hardware was cleaned and re-plated. New hammers, shanks, and flanges along with new wippens were installed. Due to the client wanting the piano to perform at the highest possible level, the action was modernized with a new custom keyset and action frame. Due to this historic nature of this instrument, it is tuned to A-435 instead of today’s standard A-440. The piano boasts a surprisingly rich and powerful quality of tone. With the new modernized action, the piano is incredibly responsive. It is obvious that this instrument was a major step forward in the development of the modern grand piano. Restoration of this piano was completed in late 2017. Our expert piano technicians have spent hours beyond the norm ensuring this instrument is of top concert quality. With a stunning figured rosewood cabinet and a rich tonal quality, this Steinway Monitor Grand is a wonderful example of historic Steinway & Sons Factory quality. During the early days of Steinway, quality was high and craftsmen had access to the finest cabinet woods and other materials. The level of quality was incredible during this golden age of the piano. This tradition is one we have dedicated ourselves to continuing here at Chupp’s Piano Service. Our showroom and rebuilding facility feature a large selection of fully restored pianos for sale. For over four decades our specialty has been the refurbishing, restoration and repair vintage Steinway & Sons grand pianos. The Art of Piano Rebuilding is truly art you can feel! The Steinway & Sons Model B Grand Piano is one of the most legendary makes of piano ever crafted. It was this style of instrument that entertained First Class passengers onboard the R.M.S. Titanic and continue today as the preferred practice piano of countless amateur and professional musicians. 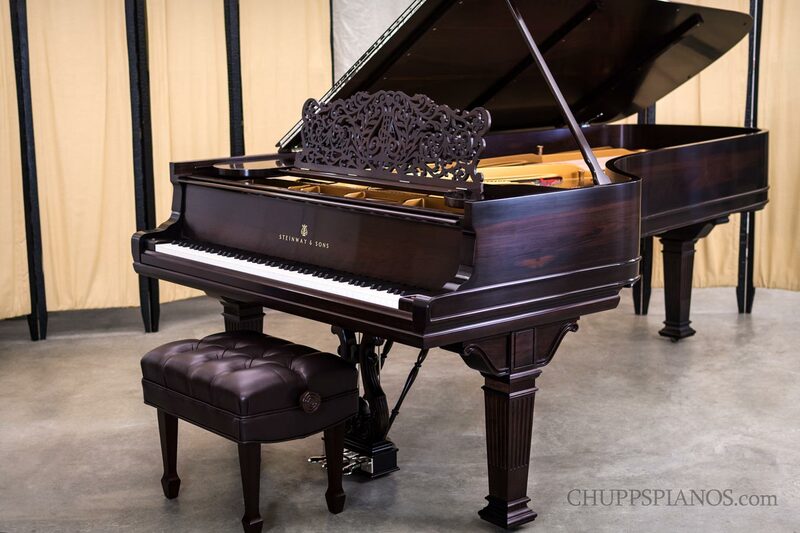 Steinway & Sons Model B #124817 stands among the most stunning instruments we have ever had the chance to rebuild here at Chupp’s Piano Service. This particular piano was selected for restoration by a client and we are proud to be able to provide them with this musical piece of art. 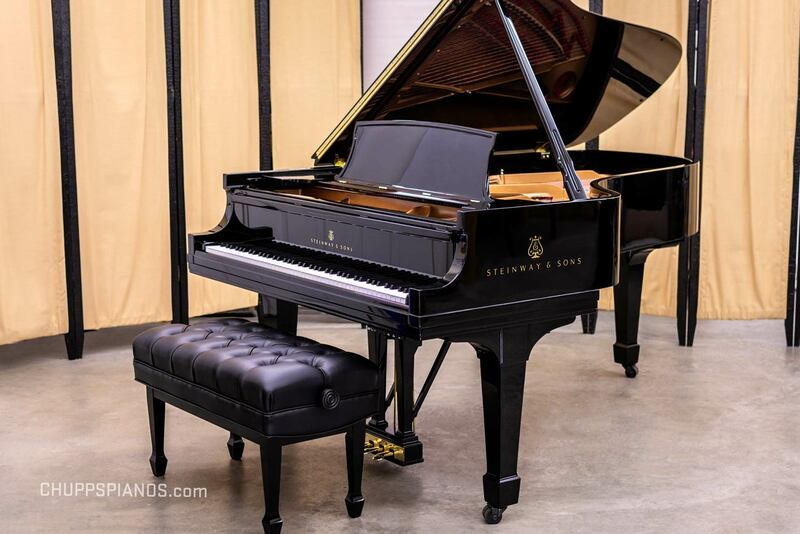 Built in 1972, Steinway & Sons Model B Grand Piano #430030 is a unique instrument with a rich musical history. 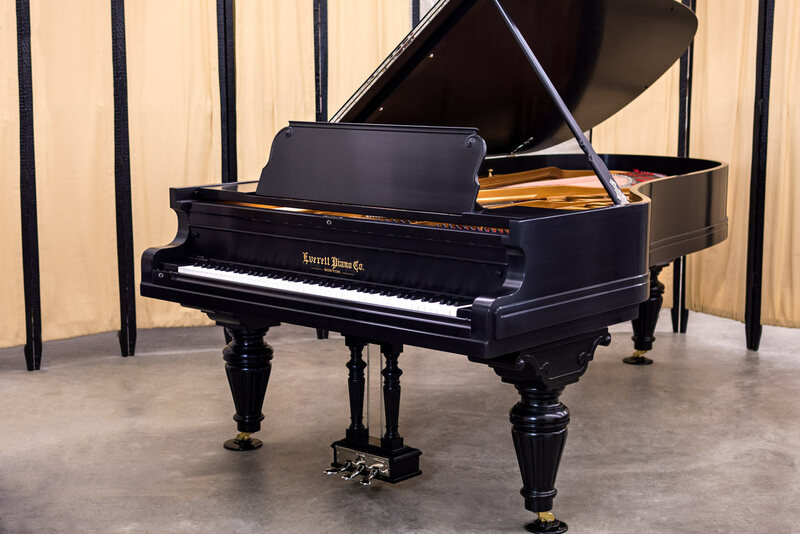 Steinway & Sons Model B Grand Pianos are among the world’s most coveted instruments – often seen in professional institutions as recording instruments. Model B #430030 served in this capacity. This seven-foot grand was purchased and used at Fireside Recording Studio in Nashville, TN. This studio was founded by Porter Wagoner and Dolly Parton. 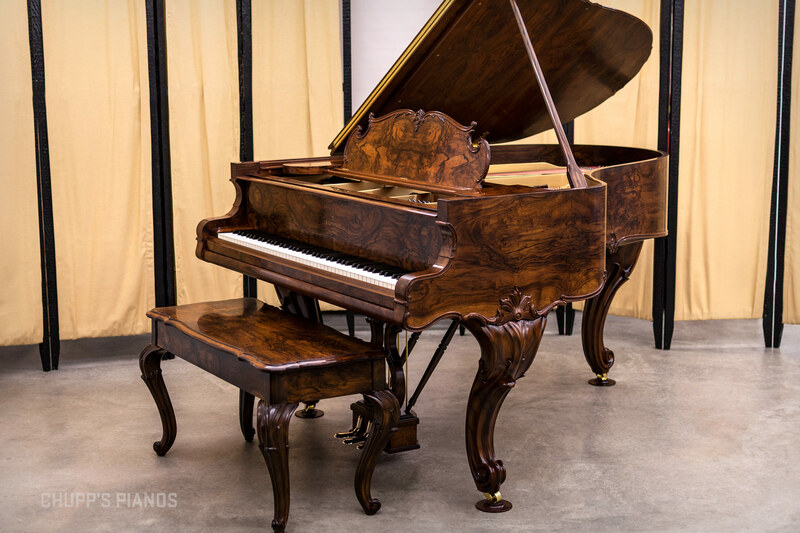 Built in 1918 at the Kurtzmann Piano Factory of Buffalo, New York, this art case grand piano is a truly stunning example of historic piano manufacturing! The late 19th century through the early 20th century saw the golden era of the piano take form, as hundreds of competing companies fought to gain their share of the burgeoning piano market. This intense competition forged lasting quality and names that continue to represent the finest in craftsmanship. 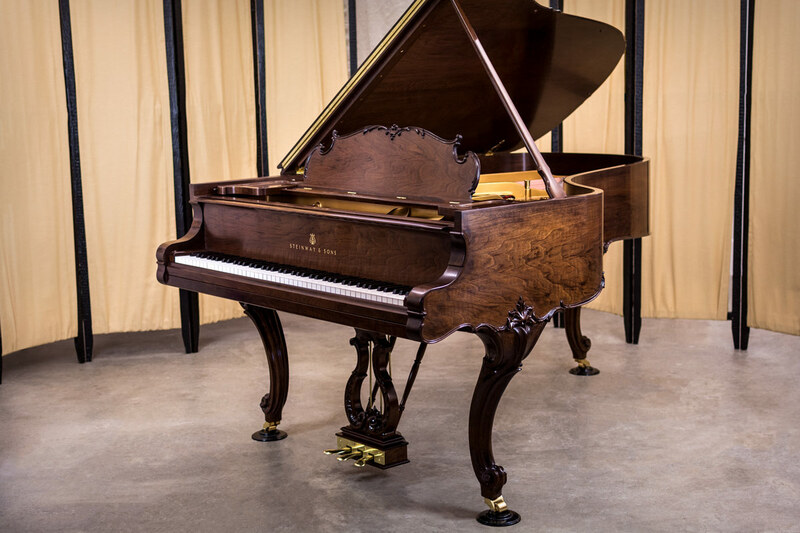 Crafted at the New York Steinway & Sons Factory in 1896/1897, this fine Steinway & Sons Model B is in an imposing yet elegant Victorian Art Case cabinet design. The Model B has long had a reputation for being a powerful, awe-inspiring musical instrument and this grand piano is no exception! This piano was selected by us for a full restoration including a new action, a rebuilt belly, and a full filled cabinet finish. When listing the makers of fine concert level grand pianos, the name “Everett” is normally not among them. Mainly known for their upright pianos built in New Haven, Michigan, Everett was later purchased by Yamaha in one of the Japanese company’s forays into the North American market. However, prior to this, Everett was a Boston based company that manufactured heavily built, premium quality upright and grand pianos. Unfortunately, much of the information regarding the early days of Everett have passed into history. The Steinway & Sons Model D is the concert piano which all others are judged against. Number 51257 was the first Model D to be completed on January 31st, 1884. Steinway Model D #53671 was built a short time later and was among the first of these legendary pianos to be built. Completed on July 21st, 1885, this New York built Concert Grand is one of the finest examples of ‘golden age’ piano making that we have ever seen. According to Steinway New York Factory records, this piano was sold to its first owner in the fall of 1918, so we are assuming this instrument was utilized as an early Concert & Artists instrument during the intervening years. Built at the New York Steinway Factory in 1917, this Steinway Model B is a wonderful example of historic Art Case piano design. The Model B has long been considered to be one of the world’s most ‘perfect pianos.’ Measuring just under seven feet, these semi-concert instruments are often chosen due to their wonderful balance of size and sound. Steinway Model B #180473 was crafted during the pre-WWII ‘golden era’ of Steinway Factory quality. The quality of workmanship and the materials available resulted in some of the finest grand pianos ever manufactured. As the development of the modern piano began to culminate, more and more work was put into turning the cabinet of the piano into a work of visual art. In 1980, Ed Hendricks of Hendricks’ Keyboards in Downers Grove, IL invited Dennis Chupp and Walter L. Boshart up to the Chicago area to meet John Steinway. John joined Steinway & Sons in 1939 and worked his way through various positions, eventually serving as the company Chairman. John Steinway is pictured signing the Steinway Service Manual for Dennis. Through the great assistance of the late Ed Hendricks, Dennis would later have the opportunity to train at the New York Steinway Factory in March of 1981. Error: Error validating access token: Session has expired on Thursday, 10-Jan-19 19:00:02 PST. The current time is Wednesday, 24-Apr-19 23:39:24 PDT.